The holidays are a tough time for nutrition decisions. Everywhere you turn there are cookies, candy canes, and cocktails on offer. It can be hard to find a balance between getting into the festive spirit and maintaining a healthy diet. Because I like to indulge in holiday treats when I go out, I have two nutrition ‘rules’ to get me through the season. The first is that I only eat the treats I really like. I used to give in to treat-eating peer pressure. I would feel rude if I didn’t accept every goody on offer. But now I’m strict and limit myself to only those sweet treats that I love. The second is that I make sure my everyday diet is extra healthy and full of vegetables during the holiday season. That way it isn’t so bad if I indulge in less nutritious food when I’m out. 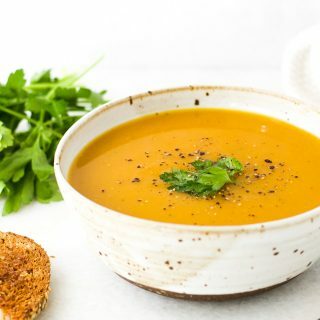 That is how this simple vegan squash soup came about. 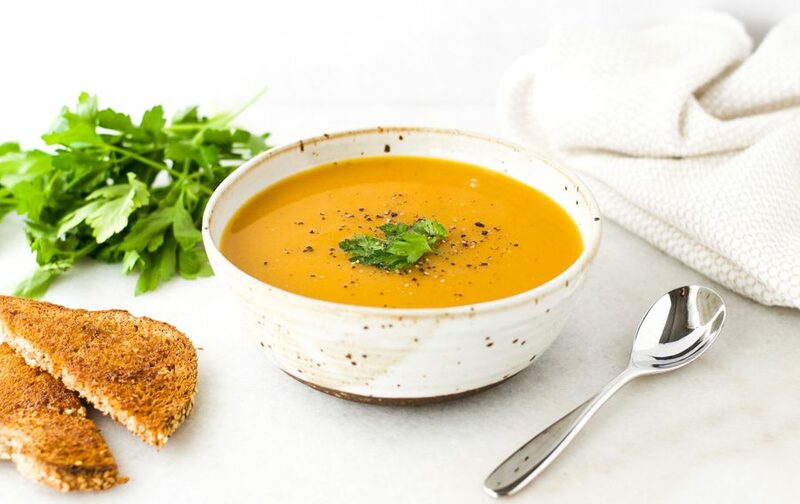 This squash soup really is simple. 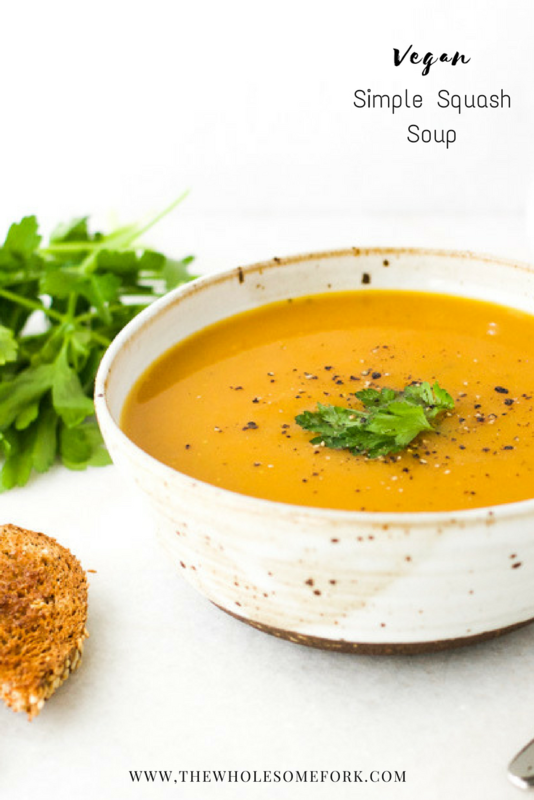 Made from nothing but butternut squash and onion with some spices and vegetable stock, you can’t get much more straightforward. And you can even swap the squash for pumpkin if you prefer (or that’s what you have on hand). The turmeric adds some anti-inflammatory action to this already healthy dish, and the cayenne adds just a touch of heat to lift the flavors a little. It makes a great lunch or dinner, and goes perfectly with some crusty bread and a side salad. All in all, a great way to include more veggies in an otherwise treat-laden holiday season. Add enough cold water to the baking tray to just cover the bottom of the entire tray. Place in the preheated oven for 35 minutes. Remove from the oven and leave to cool for a few minutes. Then scoop out the flesh and set to one side. In a large pan, heat the olive oil over a medium heat. Add the onions and garlic and cook covered for 5 minutes. Add the turmeric, coriander, and cayenne, and cook for a further minute. Add the squash, vegetable broth, and water, bring to a boil then reduce heat to simmer, cover, and cook for 10 to 15 minutes. 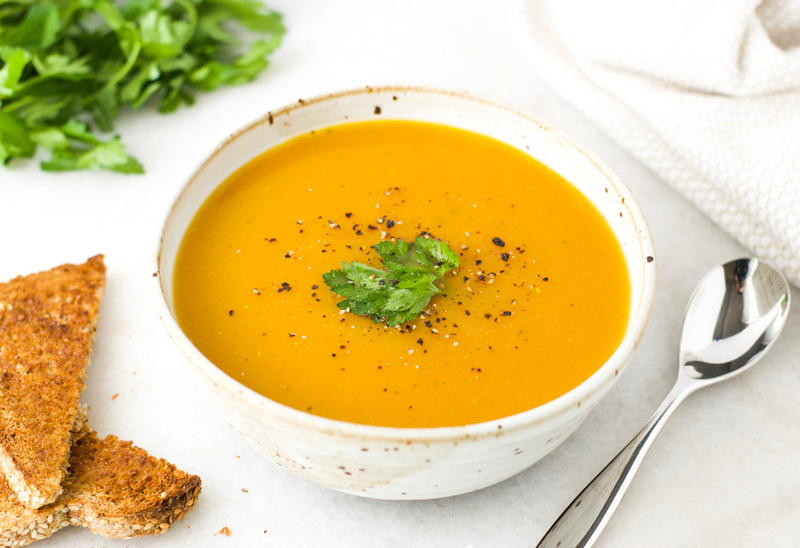 Blend the soup using an emersion blender or food processor. Return to the pan, add salt and pepper to taste, and serve. *If using a pumpkin, place the whole (uncut) pumpkin on the baking tray and place in the oven for 50 minutes. Thanks for healthy soup for my kids!